Under the Harrow is a short sharp psychological thriller in which a woman investigates the murder of her sister and in doing so needs to confront the secrets of their shared past. The book practically opens with Nora finding the bodies of her sister Rachel and her dog brutally murdered in their house in a small village outside of Oxford. Not able to fully trust the police, Nora decides to stay in town and try and uncover the murderer herself. There are secrets in the sisters’ shared past. Rachel was beaten by a stranger on her way home from a party when they were in their teens. When no assailant was found the two girls kept watch over all similar assaults and haunted the courts of North Yorkshire, trying to identify the assailant. Despite Nora warning her off, it seems that many years later Rachel was not only still looking but also living in fear that the man will return. Nora at first comes across as one of the many cut-out domestic thriller protagonists currently appearing across crime fiction. She has issues with alcohol and finds herself losing her identity as she immerses herself in her sister’s world. But she is actually an effective investigator, her determined and rule-fee approach allowing her to crack open secrets more effectively than the police who eventually put her on their radar as she starts to get more and more out of control. 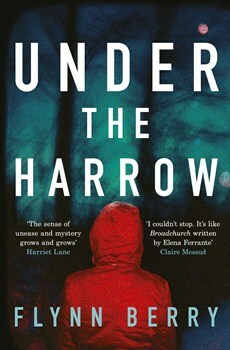 In the end, Under the Harrow is an effective and atmospheric thriller. The small British village of Winshaw is no cosy Midsomer Murder locale but a small community with its own secrets and a split between the haves and have nots. Flynn Berry handles the twists and reveals well, keeping the reader engaged but always off balance. This is not so much the case of an unreliable narrator withholding facts but rather Berry ensuring that the reader is never sure how much to trust Nora’s judgement, particularly as she becomes more and more reckless. And this is a quick read with little time to reflect on that recklessness – the type that thriller fans can and will devour in a single sitting.